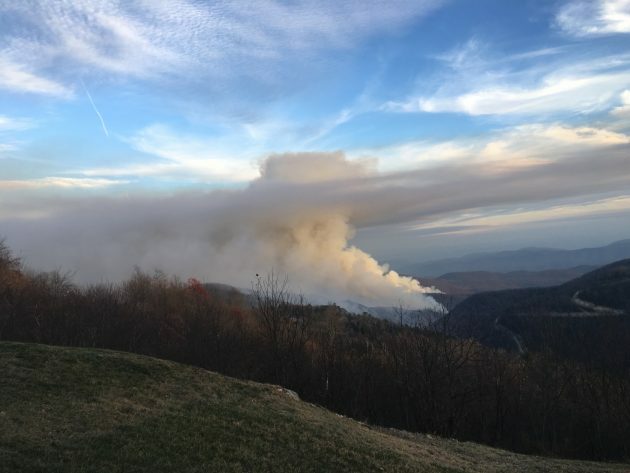 REMINDER – If you have family or renters or anyone from out of the immediate area coming into the High Country make them aware there is a burning ban in effect. Local fire departments continue to get calls about outside burning taking place. The ban remains in effect until further notice. UPDATE 9am Wednesday November 23, 2016 – As of 8:30 AM the Horton Fire remains at 20% contained and approximately 700-800 acres. The fire is expected to grow to approximately 1500 acres through the day but that growth remains inside the identified containment areas. Over 50 firefighters remained on the fire overnight to strengthen containment lines and to ensure protection for homes in the area. 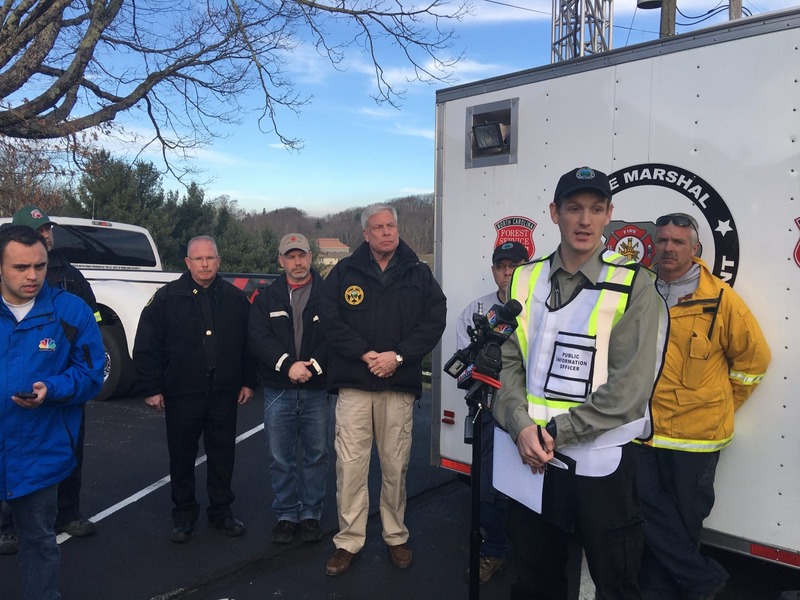 UPDATE – 6pm Tuesday Nov 22, 2016 – Officials with several different organizations held a press briefing on Tuesday afternoon. 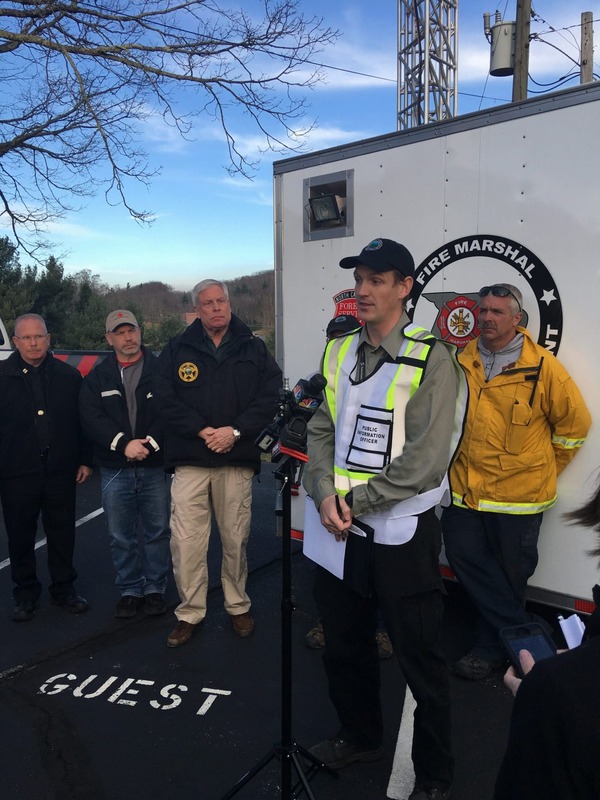 Representatives from the Forest Service, Watauga County, Watauga County Sheriff's Office and the American Red Cross were on hand to give an update. Afterward members of the press were escorted to a vantage point to see the fire. The video and some photos are below. Written highlights from the press conference can be found below the photos posted. 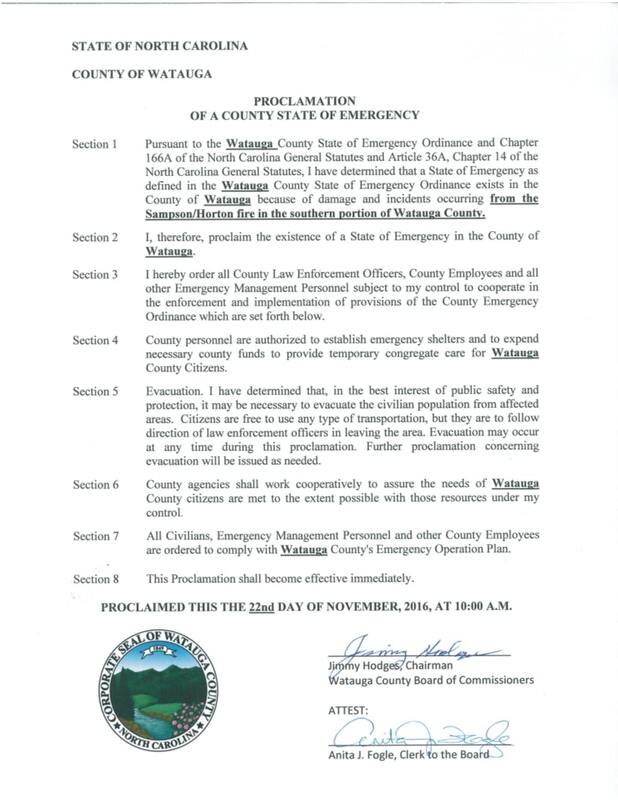 Also at approximately 10:00 am today Watauga County Board of Commissioners declared a county state of emergency for the Horton Fire. The declaration frees up additional resources that can be used in response to the fire. As of 4:00 PM the Horton Fire was 20% contained and approximately 700-800 acres. Further fire growth is expected within the containment lines within the next 24 hours. There was moderate growth in the fire throughout the day but weather conditions are favorable for maintaining and increasing containment around the fire tonight. Fire fighters made good progress building and strengthening containment lines throughout the day. Approximately 100 firefighters from 19 different agencies are now involved in the response effort. There are no structures burned at this time and there are multiple fire engines assigned specifically for structure protection near the fire lines. The Red Cross continues to have a shelter open at Alliance Bible Church. Pets can be taken to Watauga Humane Society. UPDATE 1:35pm Tuesday Nov 22, 2016 – Crews continue to work to contain the Horton Fire. Additional crews from Alexander, Avery, Catawba, and Wilkes county are assisting. The objective currently is to establish containment around the wildfire. Work is being completed today to widen fire containment lines. The fire is burning in steep, heavily wooded areas but weather conditions this afternoon and evening are forecasted to be favorable, according to the @FireHorton twitter account. 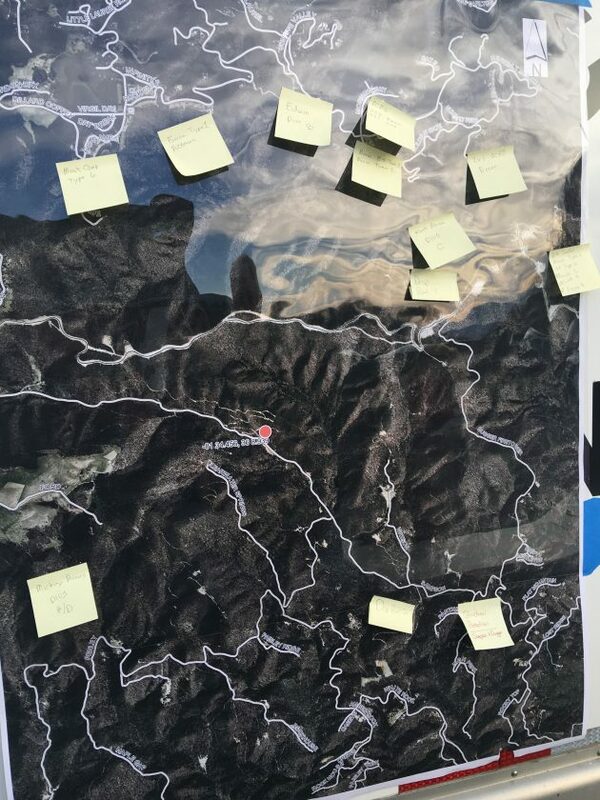 Watson Drive has been evacuated and residents along Dugger Fire Tower Road and Flat Mountain Road should continue to prepare for imminent mandatory evacuations. If residents feel their safety is in danger, county officials recommend they self-evacuate to a safe location. A Red Cross shelter is open at Alliance Bible Fellowship church in Boone. Evacuees with pets may take pets to Watauga Humane Society. Map showing approximate fire area provided by fire officials. 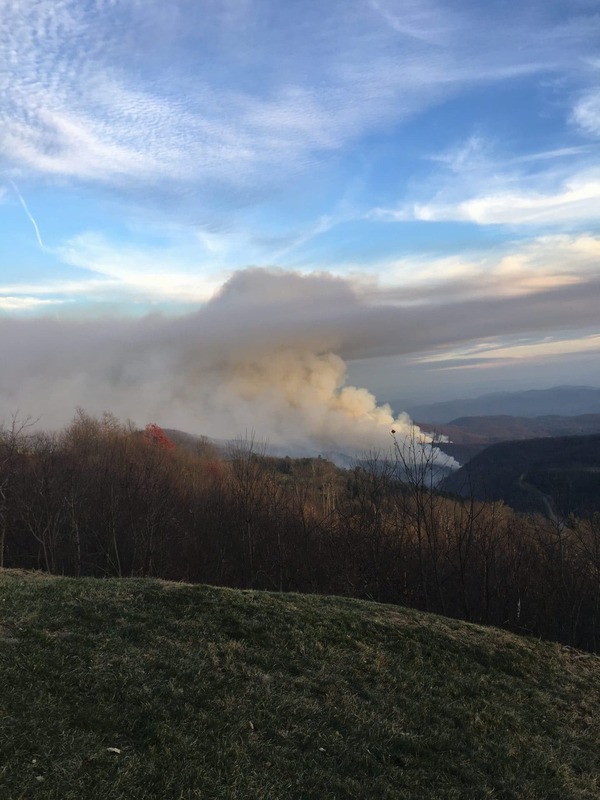 UPDATE 9am Tuesday November 22, 2016 – Firefighters and emergency response personnel from eight fire departments are actively fighting the Horton Fire. The fire began at approximately 7:00 PM Monday 11/21/16 near the intersection of Sampson Road and Penley Road. Multiple fire crews responded to the fire and have been battling it overnight. As of 7:00 AM this morning the fire size was approximately 400 acres with zero containment. The fire is threatening 55 homes. Watson Drive has been evacuated and residents on Dugger Fire Tower Road and Flat Mountain Road should prepare for imminent mandatory evacuations. 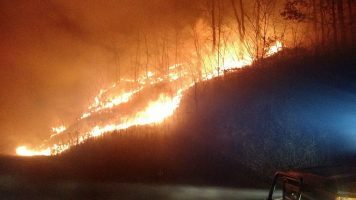 A Twitter account has been set up to share information on the Horton Fire. Follow @FireHorton for updates. 9:30pm Monday November 21 – Fire crews have switched to a radio frequency, that unless in the immediate fire area, is not able to be listen to by scanners at large. Updated information will be posted as it becomes available on Tuesday morning. 7:45pm Monday November 21, 2016 – Multiple fire departments have been dispatched to a large woods fire in the Sampson area of Watauga/Caldwell. Units from departments in both Watauga and Caldwell are responding to the scene. Map below depicts the general location of the fire(s). Penley Road is being used as a reference point as it was mention in scanner traffic.